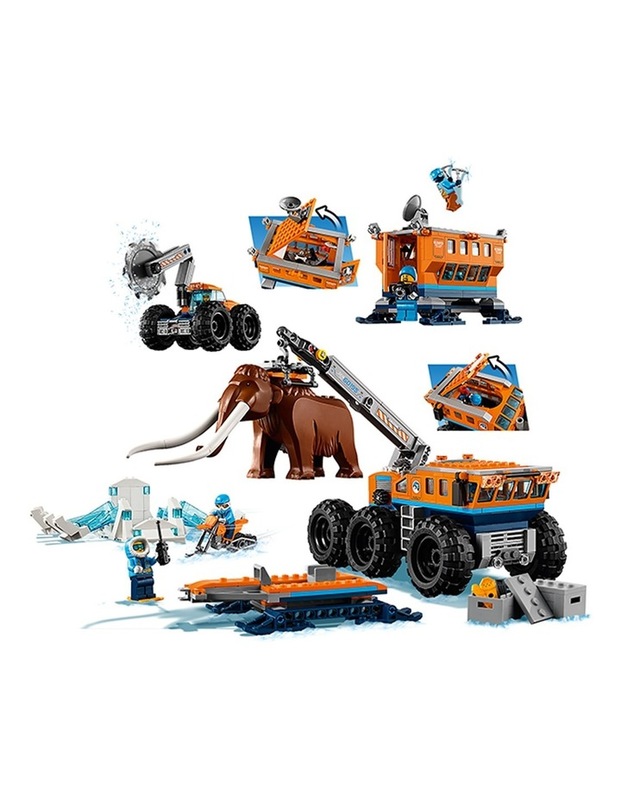 Alert the Arctic Expedition team and get the LEGO City 60195 Arctic Mobile Exploration Base ready to go! Once you're at the dig site, get the base set up and start working. Analyze samples in the mobile lab while the explorers check out the area for other interesting items on the snow bike. Hey, what's that in the ice block? Wow, that mammoth is massive! Come on, everybody; it's time to dig up some history! 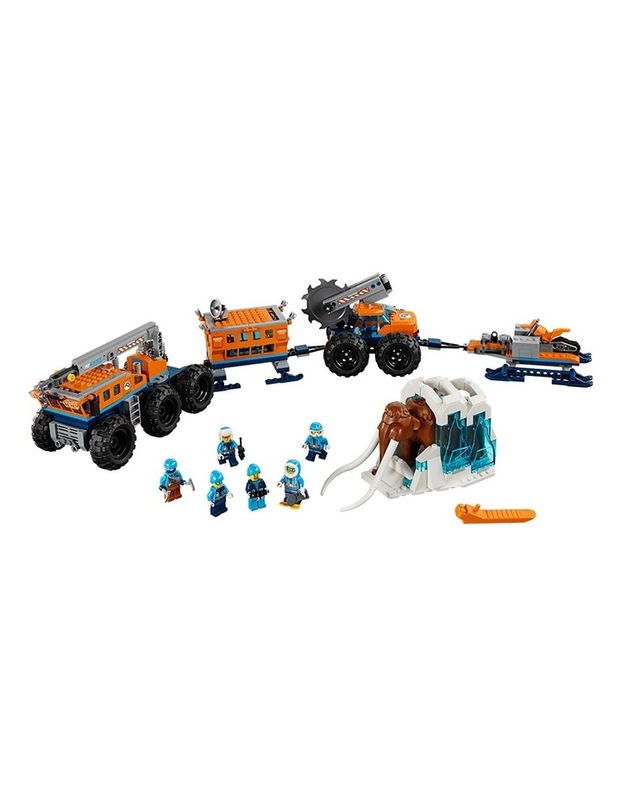 - Includes 6 LEGO minifigures: 4 arctic explorers, an arctic expedition leader and a driver, plus a mammoth figure. - Features a crane vehicle with rotating, articulated arm, hook, all-terrain wheels, large hauling platform, trailer, a mobile lab unit with radar dish and opening door, a mobile saw vehicle with articulated arm and rotating saw, plus a snow bike. 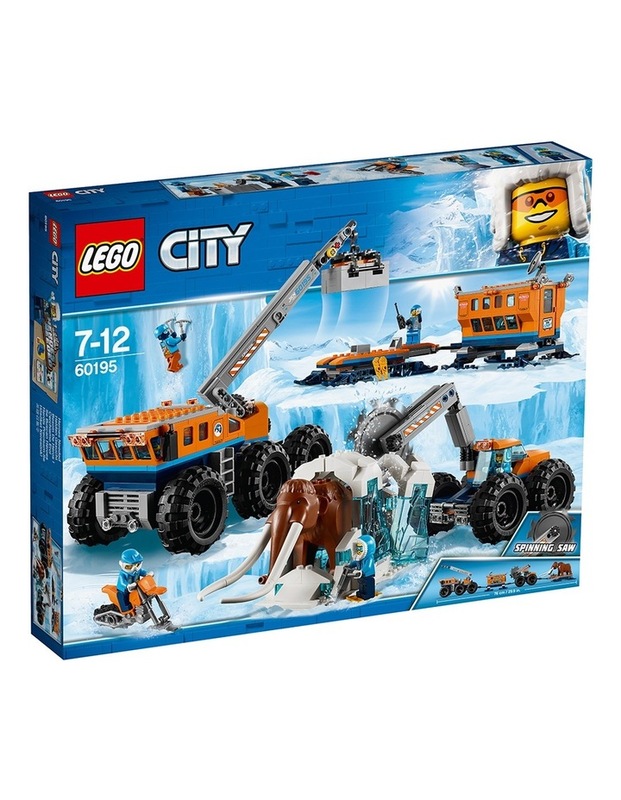 - Also includes a frozen' mammoth figure encased in a large ice build with white and translucent blue bricks. - All vehicles except the snow bike hook together in a train formation. - Accessory elements includes 2 saws, jackhammer, 2 ice picks, 2 mugs, radio, bone, camera and 2 pairs of snowshoes. - Use the crane to set up the mobile arctic base camp before you excavate the mammoth. - Lower the saw arm to cut into the ice and free the mammoth. -	Hook the crane onto the ice block and load it onto the trailer to haul back to base. - Analyze different findings at the site in the mobile lab before you head to base camp. - Crane measures over 4 (11cm) high, 8 (21cm) long and 4 (11cm) wide. - Mobile lab measures over 4 (11cm) high, 5 (13cm) long and 3 (8cm) wide. - Mobile saw measures over 4 (11cm) high, 6 (16cm) long and 3 (10cm) wide. - Snow bike measures over 1 (3cm) high, 3 (8cm) long and under 1 (1cm) wide. - Mammoth stands over 2 (7cm) high.